IS A MOBILE PRESENCE NECESSARY FOR BUSINESSES? Emphatically Yes, Do you know Smartphone usage has been on a tear as of late? Nearly three-quarters of Americans check their mobile phones at least once per hour, according to a Gallup poll. Is now the time to go mobile? There is no better time. People spend 174 minutes on mobile devices every day. Do you know push notifications can be used by any niche to put your brand name directly in front of the smartphone owner? The projections around app driven revenue are staggering. Non-game app downloads are estimated to grow 23 percent in the next five years, exceeding $182 billion in 2020. Smartphone adoption in emerging markets should see mobile app store downloads more than double between 2015 and 2020 (Small Business Trends). To build a native App can be expensive, plus the maintenance expense is ongoing. So how does a business reach the mobile user without a native App? Thymbol has the solution. 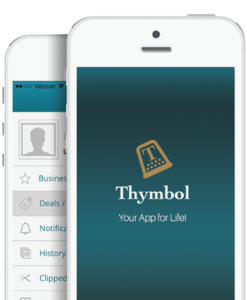 Thymbol is an App based mobile marketing platform for businesses. On Thymbol each business has a Branding Page with the business logo and a video introduction of their business. Digital coupons can be created in real-time giving the business owner control of their deals and promotions, building the business’s sales and customer loyalty. Push notifications boost repeat visits and keep the customer connected. There is a business description, hours of operation and email address to help accelerate customer contact with the business, enhancing relationships with customers where speedy responses are highly prized. There are no contracts and a first month free trial. Yes, now is the time to escalate your Business to a new level and reach mobile users! “The companies that transform their business processes using mobility will achieve new levels of success. The time for business process transformation is now”(Huffington Post). Let Thymbol give your business the mobile presence that is so vital in today’s market. Learn more now, just click on the Features tab at the top of the page. Go Mobile today starting as low as $100 a month.